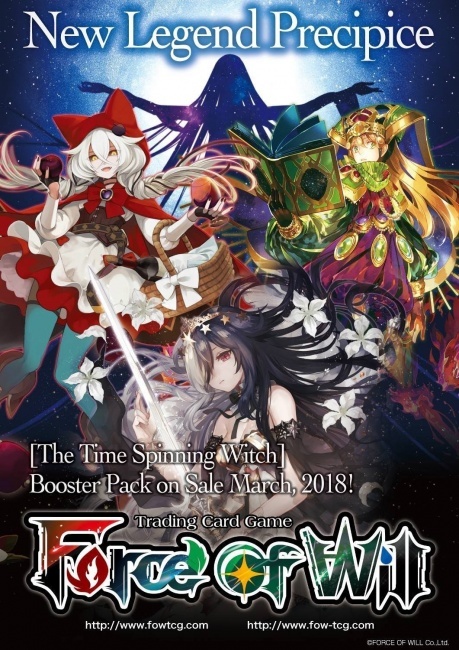 The third installment of the on-going Reiya Cluster arc for the Force of Will Trading Card Game, called The Time Spinning Witch, will release on March 9, along with the second Reiya Cluster Starter Deck. A pre-release event will be held on March 2. The Time Spinning Witch picks up where Advent of the Demon King left off (see ��Force of Will� Ushers in �Advent of the Demon King��). Like that expansion, it uses a booster format designed to support draft-style gameplay as well as casual and tournament play. Under this format, basic rulers and magic stone cards are not included in the booster packs. Instead, each 36 pack booster box includes a special pack with six copies of each basic magic stone and one each of the basic rulers. The full expansion will include 165 different cards, including the basic magic stone and ruler cards. The first printing of the new expansion will feature upgraded display boxes that can be used as card storage boxes. In addition, each box will include one limited edition promo card, and every case of six displays will include a rubber play mat. Force of Will will release the second Reiya Cluster Starter Deck on the same day as The Time Spinning Witch. The as-yet unnamed starter will include everything a player needs to start playing, including a ruler card, a 40-card deck, 10 magic stone cards, a playsheet, and a game manual. The starters will be sold in five-deck displays. Store that choose to hold a pre-release event for The Time Spinning Witch on March 2 can order a Reiya Cluster 03 Pre-release Kit.